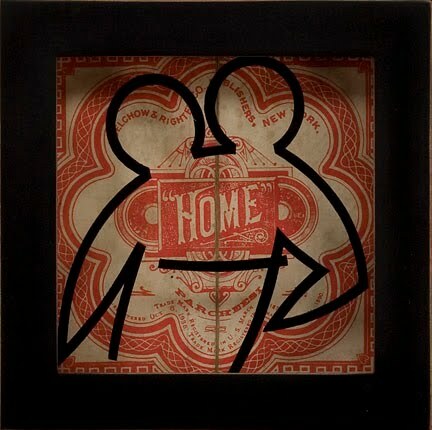 Today I am posting a photo of my assemblage Match from an ongoing series about twins. I am unsure about the basis for my personal interest in twins. There exists however, a universal fascination with the mystery of sameness and opposites, of duality and the stories that twins inspire. Across cultures and through history, myths of twins as: partners (the Roman Romulus and Remus), rivals (the Egyptian Osiris and Set), opposites (the Greek Apollo and Artemis), and two haves of a whole (the Greek Dioscuri, Castor and Pollux) are evidence of our interest and attempt to explain this intriguing natural phenomenon. Match is a play on the various definitions of the word match and the associated condition of twins. 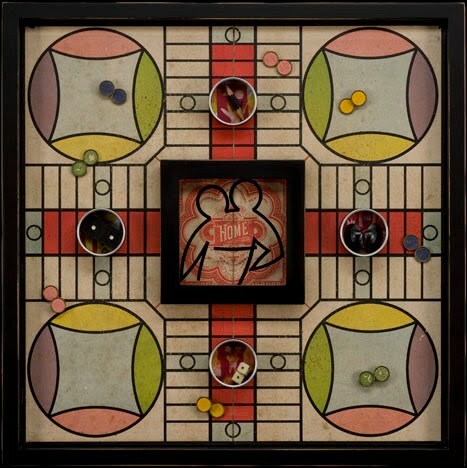 In my assemblage, Parcheesi is the organized game that may be characterized as a match. Contestants move color differentiated and matched disks by rolling a set of matched dice along paths that mirror (match) each other in visual organization with Home as the goal. I have introduced a doubled ended pencil in this game of conjoined twins as a symbol for two sides to every story or a way to keep score, a bivalve as two haves which make a whole and protect the core which is home, a set of dice, each identical, that will in combination always be greater than the one, and the double white pip on black domino, symbolic of mirrored opposites that appear exactly the same. I enjoy the lyrical quality of your work and like your comments and reflections about twins in your assemblages. There is a very interesting sociology book called "Friends and Lovers" by Robert Brian that you could find in a University library (unfortunately it's out of print). It has a fascinating chapter on twins and specifically how different cultures have dealt with the topic. I found the book as a whole fascinating as well. Check it out, you find more fodder for your subject matter there.